Yesterday Bryson and I went on an adventure downtown to visit daddy at work. Mike's building is right in front of a Trax station, so that's what we rode to get there. Bryson waited patiently behind the yellow line for the train to come. I let him bring one toy and he chose his pirate hook (bought at Lego Land by Mommy Kim), which he wore on his hand pretty much the whole trip. Bryson sat like this the entire way there. 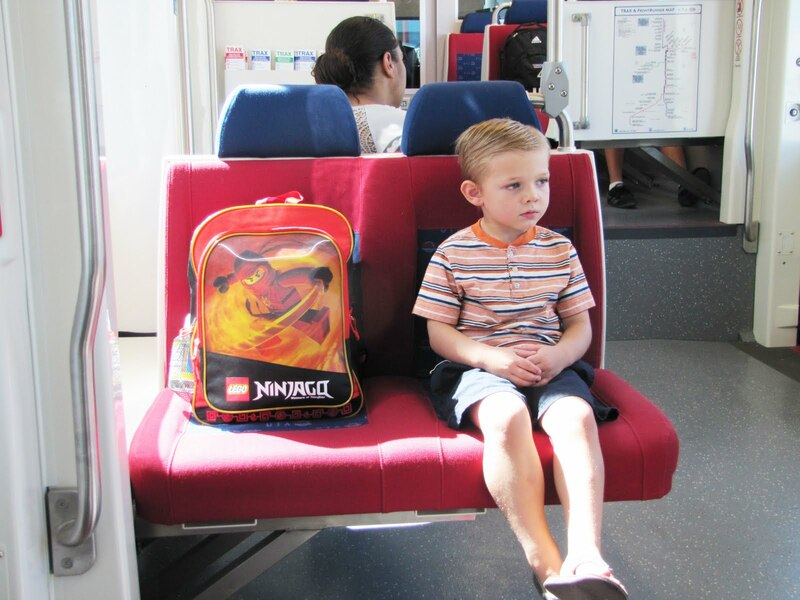 He thought the train ride was "so boring." I love being downtown. There is such an energy there. Watching all of the business men and women in their suits rush here and there was awesome. 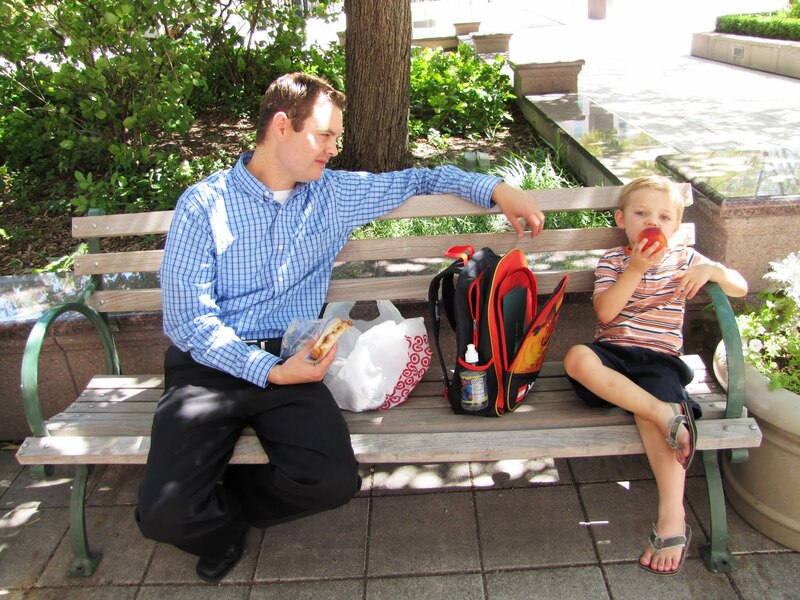 Mike met us outside his building and we walked across the street to the Gallivan Center where we sat and ate lunch. Bryson loved chilling with his daddy. Before kissing daddy goodbye and sending him back to work, we stopped for pictures in front of this cool water feature at the Gallivan Center. Then Bryson and I rode Trax over to the Church History Museum to play in the children's area. They've changed it since we were last there and Bryson loved it. 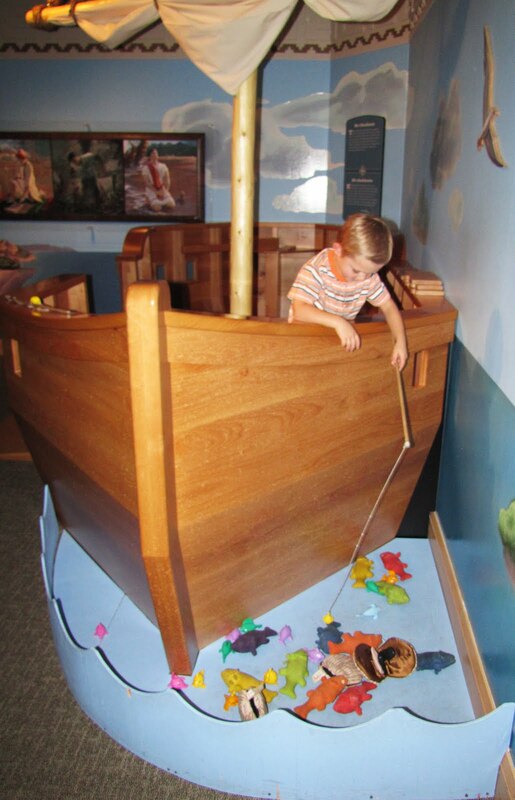 His favorite part was playing in Nephi's ship, which was equipped with a real live liahona! Bryson and I had fun acting out the story of Nephi and the ship. Bryson played the part of Nephi and kept transforming himself into a pirate. It was awesome. Then we hopped back on Trax and rode it over to the Salt Lake City Public Library. Bryson was a master at pushing the buttons at the intersections we had to cross on the way there. 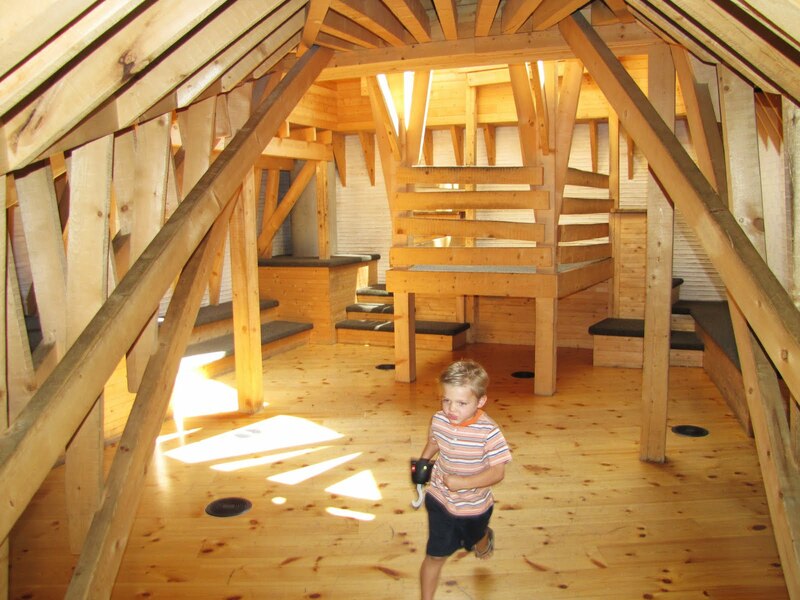 At the library we went downstairs to Bryson's favorite two rooms-- the ice cave room and the attic room. After Bryson wore himself completely out, we jumped back on Trax and went home. We plan to make our downtown adventure a monthly tradition!